Folk embroidery and painted items in the archives of Nordiska Museet in Stockholm were the inspiration for these folksy printables in antique colors. The colours in the illustration coordinate beautifully with Kraft paper and cardstock, as well as handmade and recycled papers. So those would be good choices for wrapping paper and additional cardstock items. The 3D Mug Set is included! "I just discovered your website last week. Quickly became an instant fan - I love your style! 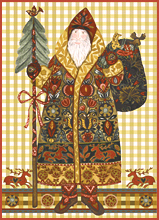 A few days ago I purchased a couple of your Christmas ranges to use for our cards this year. The new Santa is fabulous - can't wait to get started with it! • A stocking front and back for a paper stocking or to iron off onto cloth like unbleached cotton and sewn. Just add a seam when cutting out. Makes a nice scent sachet in both paper or textile versions.